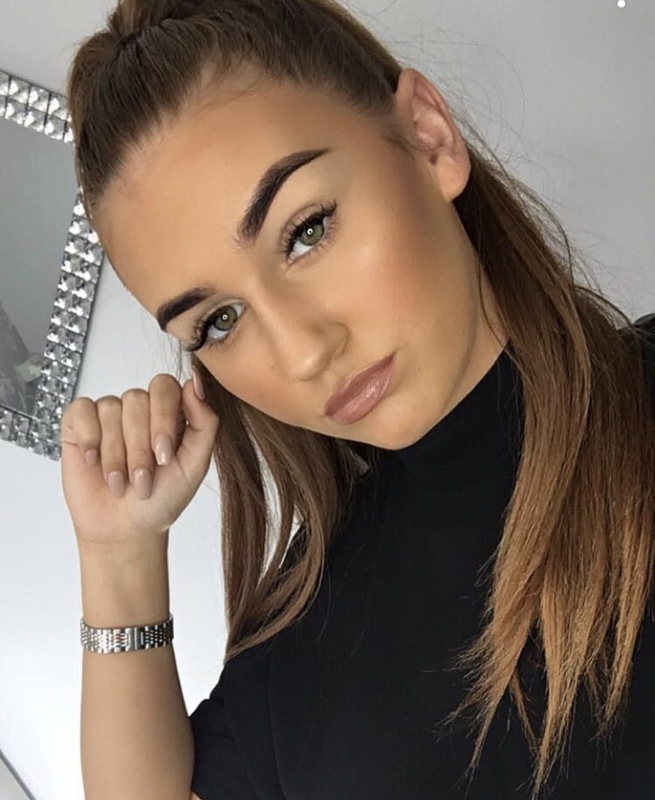 I love a flawless, bronzey, full coverage base for any makeup look! I've tried and tested so many products over the years and these are the best that I've tried so far. So I'll take it step by step and explain the products and how I apply them. So get yourself a cup of tea and some munch because it's going to be a long one! Most of the time I use a primer just to make my makeup last longer and to make my skin look more awake. 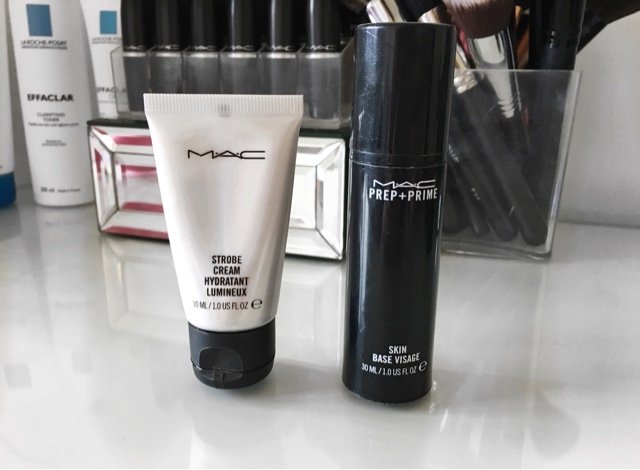 After moisturising I mix MAC Prep+Prime Skin Base Visage and a small amount of MAC Strobe Cream between my fingertips, smooth it all over my face and leave it for 5-10 minutes before applying my foundation. The Skin Base has a slight radiance to it which brightens my skin but I add a small amount of Strobe Cream to give my skin that extra glow (definitely something I need on a Monday morning). 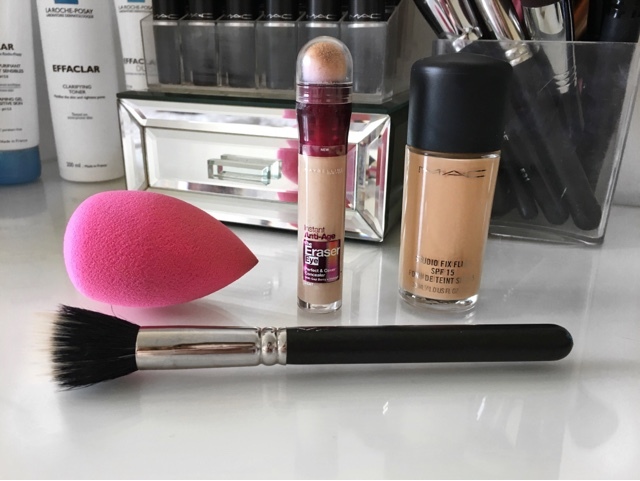 I then apply MAC Studio Fix with a MAC 188 brush in circular motions and then take a damp Beauty Blender to blend all the foundation together and remove any excess to avoid any areas looking cakey. It's important to use the same area of the Beauty Blender so that product is picked up and deposited evenly on the face. I have used so many foundations and I always come back to this one, I find that the coverage is full enough without being too thick. I used to use Estée Lauder Double Wear but it was so full coverage and so thick that it made my skin bad. I then use Maybelline Instant Age Eraser Eye underneath my eyes and blend it out with the same Beauty Blender. This concealer is truly amazing it's so lightweight with a great coverage. 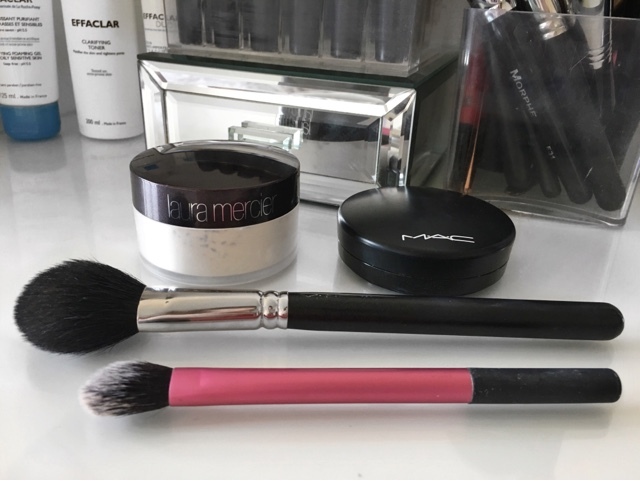 The first thing I do after blending out my concealer is set my undereyes using the Laura Mercier Loose Translucent Setting Powder with a Real Techniques Setting Brush. This powder is flawless as I've mentioned before, it's so silky and I've never seen a crease under my eye since using this. I then set the rest of my face using the MAC Mineralize Skinfinish Natural with a MAC 129 brush. This powder has a slight radiance to it which makes it look natural on the skin (do not worry this is not like putting a highlighter all over your face!). I always set my foundation with a powder but I still want my skin to look like skin and this powder is perfect for that as it doesn't make me look cakey at all. 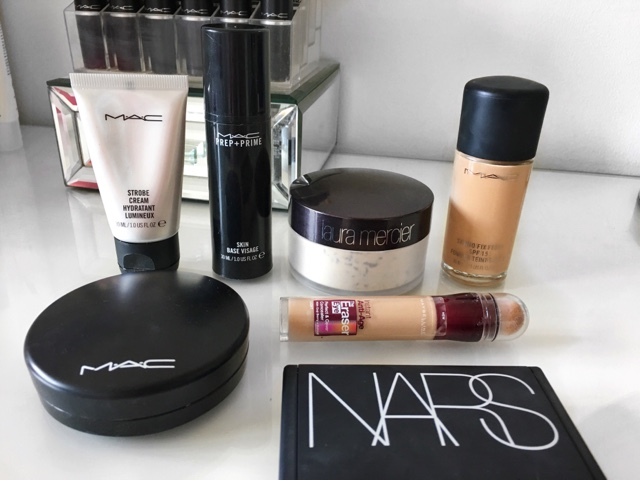 After setting my face I use the NARS Bronzer in the shade Laguna with a MAC 168 brush just under my cheekbones as a contour then up to my temples and blend it into my hairline for bronzed skin. This bronzer is my absolute holy grail, I'm on my second batch already and will definitely repurchase when I've finished this one! It's a beautiful warm brown but it doesn't look orange on my skin which is what I love about it. This is probably my favourite part of my makeup because I love a strong, popping highlight! 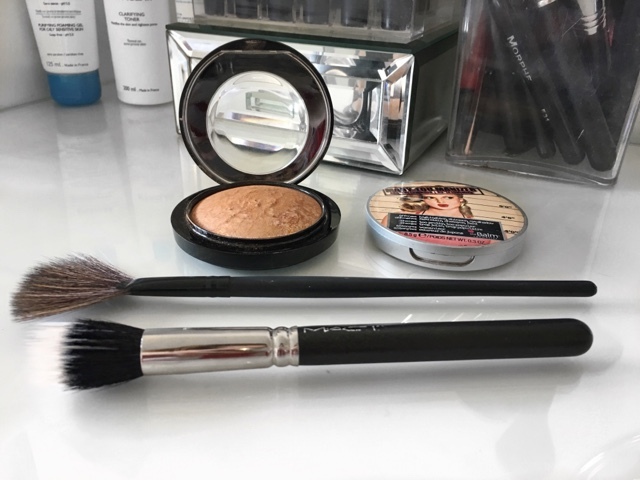 First I mix MAC Mineralize Skinfinish in Global Glow with theBalm Mary-lou Manizer with another MAC 188 brush (not the one used for foundation as this could end in disaster!) on the tops of my cheekbones and just above my eyebrows. 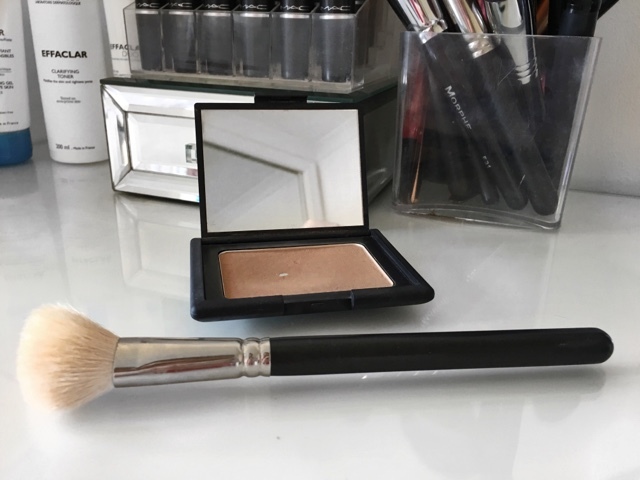 Then for a more intense highlight I take a fan brush (the one in the picture is just a cheap one - you can use any fan brush!) and take the Mary-lou Manizer alone and apply it to my cheekbones, tip of the nose and on my cupids bow. So that concludes my flawless, bronzey, glowy base routine! Let me know if you enjoyed reading this as I could do more "How To" posts (I have a lot of tips to share!) also let me know what your favourite base products are as I am nosey and I would love to know! See you soon!